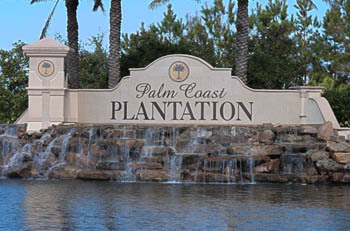 Palm Coast Plantation is a gated community situated on a breathtakingly beautiful lake and the first choice for buyers seeking resort living on Florida’s coast. Homes and lots are available with frontage on the Intracoastal, lake, or four thousand square foot wildlife preserve. Formerly a privately owned hunting and fishing reserve, Palm Coast Plantation has retained its atmosphere of quiet peace while providing an abundance of activities for its residents. Large home sites and the option to choose your own custom builder make Palm Coast Plantation especially desirable. The community does not pressure buyers to develop their land immediately and an architectural review process ensures property values remain strong and designs cohesive. A boat launch and fishing pier is located adjacent to Palm Coast Plantation so access to the Intracoastal Waterway is assured. Emerald Lake is the crown jewel of Palm Coast Plantation: 120 acres of spring-fed freshwater lake, stocked with freshwater fish, and providing over 5 miles of shoreline. There is a community boat launch for residents and their guests to enjoy time on Emerald Lake, which is privately owned by the community. Other amenities include a very large clubhouse, pool, biking trails, as well as basketball and shuffleboard courts. Contact us to find out more about living in Palm Coast Plantation today.